I was almost as excited when I tried this couscous as I was when I realized I could put GIFs into my blog. So let’s enjoy the foliage and toast to yet another sweaty summer gone by… Enjoy! *The vegetables are completely interchangeable, choose what you like! I’ve listed what I used, but feel free to make the dish your own. 1. Prepare the couscous according to the package instructions. 2. Preheat the oven to 350F while you chop the zucchini, squash and red onion. Line a baking sheet with tin foil. Toss the chopped veggies with about a tablespoon of olive oil and spread in a single layer on the baking sheet (we’re reserving the scallions and tomatoes until it’s ready to serve). 3. Bake the vegetables for about 25-30 minutes, tossing once about halfway through. The vegetables will get soft and may even darken on the bottom (which is good! unless they’re totally black, a little bit of char adds great flavor). 4. 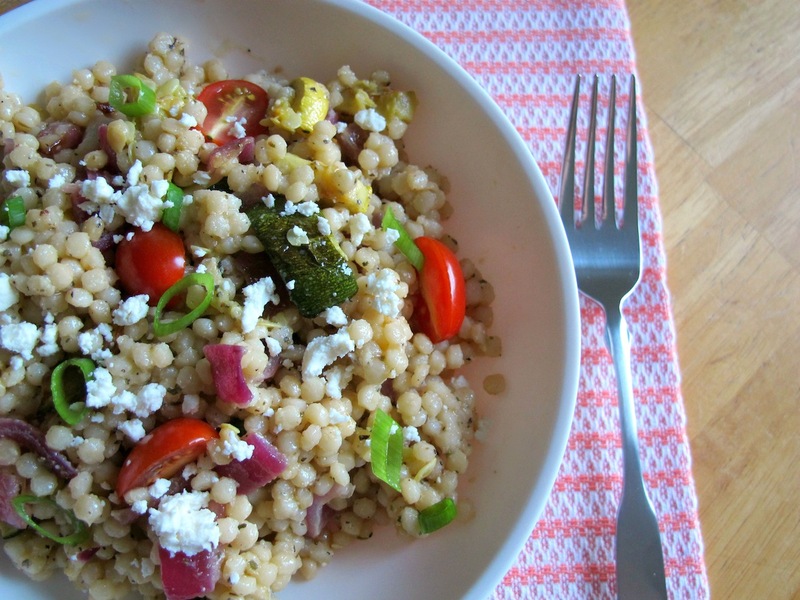 Allow both the couscous and the veggies to cool to room temp once they’re finished cooking. In the meantime, throw everything for the dressing in a blender or food processor and whiz until they’re combined and the dressing is fairly smooth. 5. Toss the veggies, couscous and 3/4 of the dressing together in a large bowl and cover with tin foil. Refrigerate the mixture for several hours or until thoroughly chilled. Stir the mixture again and add more dressing if it needs it– sometimes it sticks together and the dressing will help to loosen it again. Add the tomatoes, scallions and feta (if using). Welcome back! I definitely noticed your absence. This dish is a nice farewell to summer. You could change the veggies to roasted root veggies and voilá, hello Autumn.